As the Goodwood Junction project proceeds the area of influence and people affected by the changes has increased. This week DPTI staff were door knocking in the Foresetville Reserve area to inform residents of changes and how they will affect them. From Monday a large area of this park will be sceened off and work will begin on providing access to the areas in which the culverts will be laid so that Brownhill Creek can be diverted. This project must be completed before the bigger project begins or any amount of rain has the potential to delay the project. Their main concerns are about the location of the culvert that will deliver the water back to the original creek bed (near the pool). This location, where the creek has been laid back, is now quite beautiful and enjoyed by people of all ages. 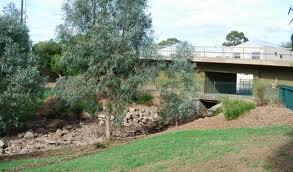 One of the suggestions is to naturalise the area from where the culvert enters the park until the water reaches the current creek location. It is important to note that no changes are proposed to the current creek bed in the park. While this will carry significantly less water it will still drain the local area and in time, when other stormwater measures are completed upstream, more water. As a resident I am very concerned about the stormwater plans during this upgrade and following the upgrade. I understand that Keswick Creek is intended to be diverted into Brownhill creek as part of the flood mitigation strategy, but as someone who lives downstream on brownhill creek surely this will mean more water volume and more potential for flooding for us. My insurance bill just went up by a massive amount and it is getting hard to secure flood insurance - we are within the area predicted to flood on the councils flood maps, though when we bought in 1990s this was not even an issue. With more and more urban infill, we are becoming more and more vulnerable to flooding, and the solutions I see council working on are diverting more water our way not less.